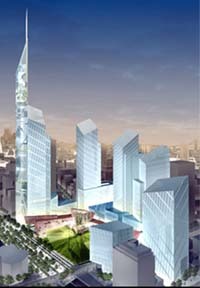 The chosen design for the World Trade Center site was announced by the Lower Manhattan Development Corporation. It is called "Memory Foundations," by Studio Daniel Libeskind. The planned design leaves portions of the slurry wall exposed, while reserving a setting for the memorial and museum in the area known as the bathtub. A 1776 foot tall spire will punctuate the skyline. "Libeskind Design Chosen for Rebuilding at Ground Zero"
"The Next Great City Center"
"... we should look closely at what we had before 9/11, and what we are about to get in its place. Realism will serve us well here, too. The World Trade Center was the poster project for the worst kind of urban renewal imposed on American cities in the 1960s and '70s - nothing changes that fact. The land was acquired by eminent domain and stripped of small businesses; the huge buildings were made possible by the Port Authority's right, as an independent government body, to bypass the city's laws and codes, as well as to take the city's land. The project amputated and eliminated Lower Manhattan's historic streets, putting in their place a vast, cold, dead plaza with a pair of grossly overscaled, architecturally undistinguished towers that instantly ruptured the magic of an intricate and evocative skyline. Some of that magic was transferred to the twin towers when light gilded and colored their bland facades, and there are those--most young enough never to have known another skyline--for whom the towers still hold a nostalgic appeal. I, for one, am unable to romanticize them. They were big. Inevitably, their size made them beacons, and then targets, and tragic emblems, in the curious and sometimes terrible way history confers immortality." "As World Trade Center designer, Libeskind is an instant celebrity"